Instructions for scheduling and managing a clinic or seminar. Has your committee already listed a seminar or clinic like the one you are leading before? If the answer is YES - wahoo!- scheduling a clinic or seminar is just like listing a trip except that you need to pick seminar/clinic rather than the trip radial button on the schedule an activity box. If the answer is NO or you aren't sure then it's time to head to your committee page and see if the Seminar/Clinic activity template exists already. In order to schedule a clinic or seminar you must have a "Seminar & Clinic Templates" folder in your committee materials and there must be activity templates in it. To add a new activity template make sure you are in the Seminar & Clinics folder, then go to Add New - Activity Template in the yellow admin bar. If your clinic or seminar will result in a participant earning a badge, make sure when you are adding a new template or editing an existing activity template to fill in the Earned Badge field. 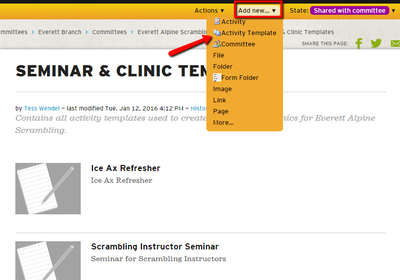 Once you have a Seminar & Clinics folder on your committee page, and know you have activity templates in the folder, you can schedule your clinic or seminar. 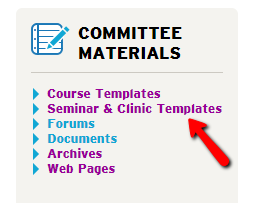 If you know you have an activity template already created in another course template and can't remember how to copy and paste the template into the new folder please review managing committee materials. Navigate to the route/place where the Clinic or Seminar is going to happen (this means going to Explore > Find Routes/places > then searching for the program center or location where your clinic is happening. Enter in the date or weekend the seminar or clinic is happening and click Book. The next page will prompt you to pick an activity template. If you don't see what you are looking for you'll need to go to your Seminars & Clinics folder and make sure the template you want is in that folder. 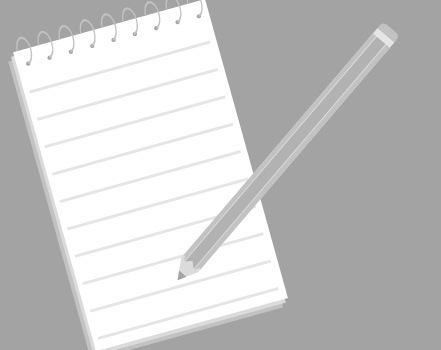 Once you've selected the activity template you'll be prompted for the meeting time and place, leader's notes, and other registration details. Once you hit save these are automatically published and will show up in both the courses and activities searches. Instructors can search for the activity and register to participate. In some cases this functionality is currently under construction, but will work properly for all courses and activities scheduled in our new system. Under the Volunteers tab there is a link that says "Find Instructor Opportunities". For your activity to show up in these sections it is important to fill in instructor pre-reqs in the activity template for your field trip or lecture. Instructors can sign up by going to the instructor opportunities link. I don't have an image for my course or activity template, where can I find a default image? Download the gray landscape image or the spiral notebook educational image. How do I award badges to my clinic participants? When the seminar or clinic is over you will need to Set Trip Results to Successful, then close out the activity to award the badge to participants. Should I call it a Seminar or a Clinic? Clinic: A one day or one-weekend educational activities that may or may not result in credit (graduation or badge). They should be stand alone experience and are hands on, skill-based rather than a lecture. 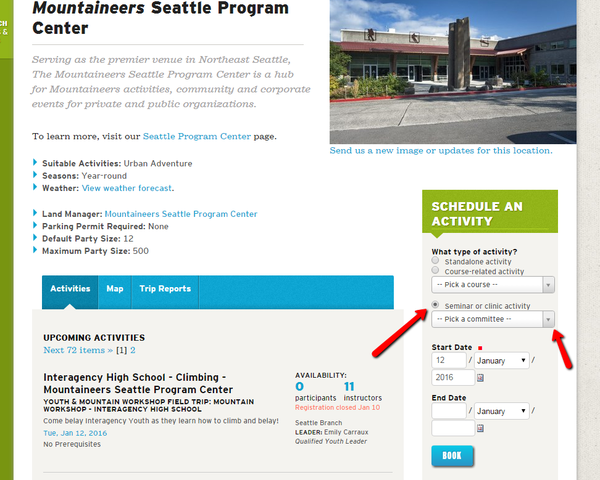 They are scheduled similarly to activities but will show up under both the LEARN and EXPLORE menus. Learn more about scheduling clinics. Seminar: A one-time event like a lecture or video demonstration, often in the evenings or "in-town. They are stand alone experiences and are affiliated with one of our activity types and may require a pre-requisite badge. For example, only graduates of the scramble course can sign up for the Winter Scramble seminar so it makes more sense to list this as a seminar rather than an event. If the seminar you are thinking about holding is open to members and non-members and doesn't have a pre-requisite skill it may make more sense to have them listed as an event. Event listings allow members to RSVP for your friends and don't require people to have a signed waiver. If you are doing hands on stuff where someone could injure themselves than it makes sense to list it as a seminar because that requires a waiver. How do I add a question for my participants to answer when they register? In the registration part of any activity (includes lectures, field trips, clinics and seminars) near where Leader's Permission and capacities. 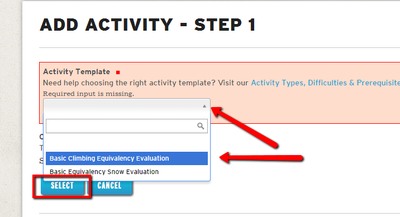 There is a question field that you can fill in to gather info from participants when registering. The question field is optional so people can register without filling it out so it doesn't hurt to mention it in your leader's notes as a reminder for people to look for it when they register.